The Store --> HAS NOW BECOME TOTALLY FREE! In her retirement, Dr. McGuire teaches and consults infrequently. However, she retains her commitment to making self-help skills of Focused (Empathic) Listening and Intuitive (Experiential) Focusing available for free. Using her free resources below, anyone can learn the skills for using Focusing and Listening alone, in pairs with friends or colleagues for personal growth, for conflict resolution, for creative problem solving in groups, and for building supportive empathic communities at home and at work. These skills are particularly important for bridging the divides between people with empathy and bringing skills for peace-making and creative problem solving throughout homes, businesses, nations, and internationally. Become an Empathy Facilitator! Focusing in Community: How To Start A Listening/Focusing Support Group (154pp.) manual. Simple instructions for learning Focusing and Listening, starting a Listening/Focusing practice group, and building community through Listening/Focusing conflict resolution and group problem solving and decision making. See Services/Programs: Self-Help for full description and sample extracts of Chapters or simply download the free PDF file here. Focusing en Comunidad: Como Empezar Un Grupo De Apoyo De Escucha Y Focusing (184 pp.) manual in Spanish. Read a Sample Chapter in Spanish and/or simply download the free PDF file here. The Changes Book: A Handbook for Empathic Listening, Experiential Focusing, and Therapeutic Community (194pg). First published in 1978, this book represents the fresh thinking of many of the members of the original Changes Listening/Focusing community started in 1970 in Chicago as a response to the Kent State Massacre. 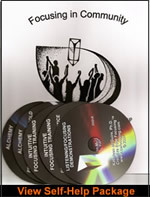 Read the first attempts of Eugene Gendlin, Mary Hendricks-Gendlin, Kristin Glaser, Jim Iberg, Ann Weiser Cornell and many others as they articulate why an egalitarian therapeutic community based upon Listening and Focusing is essential, how to teach Listening and Focusing, how to run a basic Listening or Focusing training group, and much more. See how the fervor of those times applies to today and how the Changes tradition carries on. Reformatted as a Word Document with an Active Table of Contents allowing you to choose chapters as you wish. On Google Drive as a free download here. Or if you would rather have the document in PDF format, download it here. Dr. McGuire's manual teaches how to do Experiential (EXP) Focusing Therapy. It includes the full transcript of two hour-long therapy sessions, with commentary by Dr. McGuire as therapist explaining why she intervened as she did. She describes her own experience as the therapist and what she was trying to accomplish. One client was highly intellectualized, the other highly emotional. In both cases, interventions were aimed at helping the client out of static, repetitive thoughts or emotions and into the rich, fresh "experiential ground" out of which new meanings and forward action steps could be articulated. The manual includes Experiencing (EXP) Scale ratings of each client verbalization. The EXP Scale is a highly-regarded research tool which uses a seven-point scale to measure the degree to which a client/patient is speaking from the fresh, ongoing, "intuitive feel" of present experiencing, The Creative Edge, vs. static intellectualizations. Higher EXP Level is correlated with lasting change in psychotherapy. Changes in the client's EXP level, as rated throughout the sessions, give immediate feedback on the effectiveness of the therapist's interventions in deepening client experiencing. Learning the EXP Scale offers clinically-meaningful and useful insights in helping clients to transition to deeper levels of experiencing. Click Training for Helping Professionals for further description and a video example of Experiential Focusing Therapy. "I highly recommend both the book and the video to use for training, presentations, and research, and to anyone interested in learning more about the experiential aspects of therapy." Dr. McGuire describes the power of Focusing and Listening to transform your life, turning darkness to gold, in the areas of personal meaning, relationships, parenting, and community. She includes a description of Empathic, or Focused, Listening and a lengthy complete Focusing exercise. Click here to download free MP3 files. Dr. McGuire's soothing voice takes you through five different relaxation exercises as you learn to spend quiet time inside; then five different exercises for learning to find a "felt sense" or "intuitive feel" in your felt experience. Finally, she walks you through two different versions of a Complete Focusing Session. Click here to download free MP3 files. Visit the Free Resources area of this website for much more: Articles, Personality Tests, Newsletter Archives, more… Free Resources. But first, if you haven’t yet, download our FREE Instant “Ahah!s” Mini-Manual and FREE Focusing Instructions, to see our other Free Resources, and to sign up for ongoing support.